As we prepare for HTC's official launch event today, we're starting to see some details appear on HTC's own website of the much rumored Hero. Through some URL trickery, we've managed to unearth several details that confirm the previous rumors. 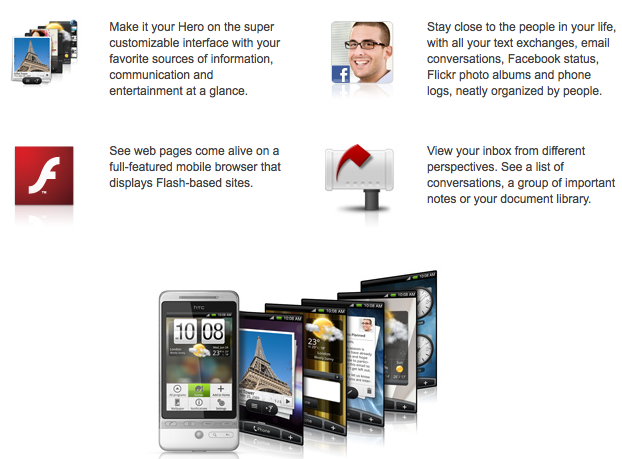 Hero includes the new HTC Sense widget-based interface that puts at-a-glance info right up front on the home screen where it belongs. A new Scenes profile feature lets you transform your phones focus from business to weekend mode. Viewing your contacts shows the usual data in addition to the interactions you've had through social networking status updates and photos from the likes of Facebook, Flickr, YouTube, and Twitter. A dedicated search button searches the phone as well as services like Twitter. 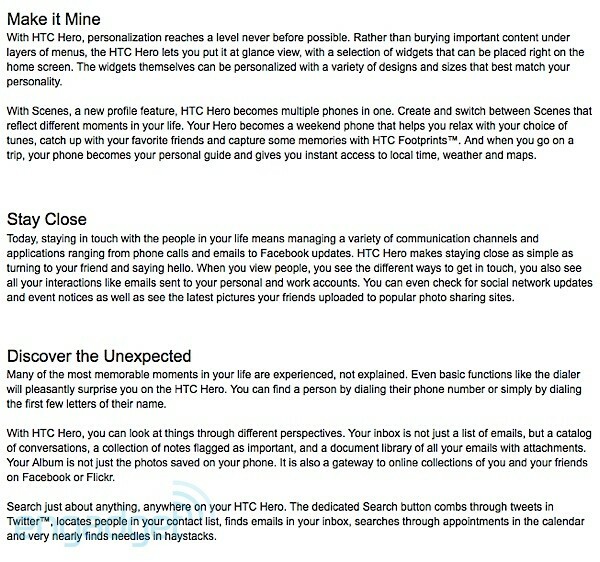 In fact, like Palm's Pre, the HTC Hero seems ready to fully integrate your local data with all your subscribed social media sites. The biggest deal here, however, might just be that HTC is touting this as the first Android device to support Flash out of the box. Inside you'll find Qualcomm's MSM7200A proc running Android at 528MHz, 512MB/288MB ROM/RAM, 3.2-inch TFT-LCD with 320 x 480 pixel rez, 900/2100MHz HSPA and Quad-band GSM, trackball, GPS, 802.11b/g WiFi, 3.5mm audio jack, G-sensor, compass, and 5 megapixel auto-focus cam with microSD expansion. It's all there baby. The White version of the device has an industry-first Teflon coating (right, just like your pans) to keep things clean and grime free. Multi-touch and anti-fingerprint coating too. Hero arrives in Europe in July with T-Mobile and Orange, Asia later in the summer, and North America even later in 2009. Stay tuned for a full hands-on, but for now, enjoy the press shots in the gallery below and the new video after the break!